DeMarcus Cousins and Anthony Davis are now 63 games into their career together, and the Pelicans are 34-29 over that span. That’s not any sort of record to be ashamed of, but it’s also just a little too heavy in the loss column to provide any assurance that Boogie and AD’s partnership will survive in the long term, let alone any evidence of dominance in the short term. Cousins will be a free agent at the end of this season, and given how many top-tier teams have run into unexpected difficulties this season, it’s a good bet that suitors for his services will be lurking at the trade deadline. Cleveland should certainly come asking about Boogie, and the Wizards would be dumb not to try and reunite him with John Wall. It’s not hard to imagine a near future in which the Pelicans are without one or both of Cousins and Davis. If they become convinced that Cousins is leaving in the summer, they’ll essentially have no choice but to flip him at the deadline, and if that happens it probably won’t be long before Davis starts working on his own departure. This is how it goes. Here’s the thing about that potential future: it would be lame as hell! 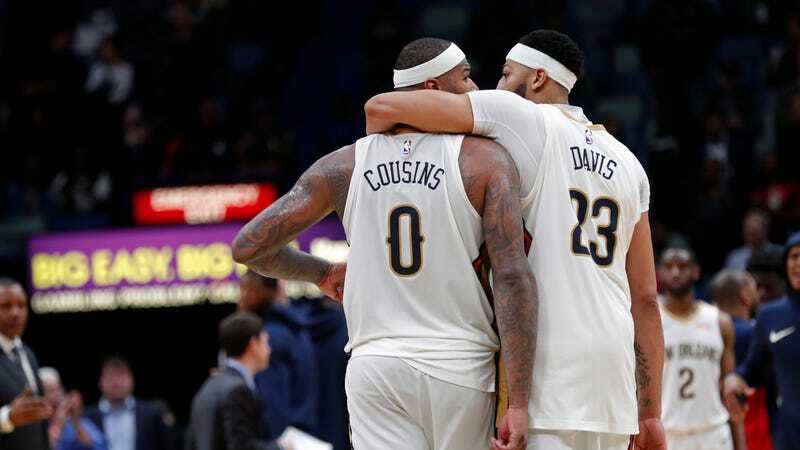 Watching Cousins and Davis learn how to play together was a distinct pleasure early this season, and the duo has only gotten more captivating since then. Davis just got done going on a three-game rampage in which he averaged 43 points, 14 rebounds, 2.3 blocks, and 1.7 steals per game on 55 percent shooting. Last night, Cousins put up 44-24-10 in a double-overtime win over the Bulls. Don’t mistake this for a rickety partnership in which the two stars involved don’t really harmonize and only manage to win games by taking turns and overpowering teams with sheer talent. Davis had 34 points, nine rebounds, and five assists of his own last night, and Cousins created a whole highlight reel’s worth of plays out of his interplay with Davis. They do stuff like this every game. They run pick-and-rolls together, find each other under the basket with nifty hi-lo actions, run the break together, space the floor for each other, drive and kick—they do everything you could ever ask two supremely talented big men to do on a basketball court in tandem. As Albert wrote on this very site back in November, the NBA has never really seen anything like the AD-Boogie partnership, and the sad fact is that if the Pelicans do decide to dismantle it, we’ll likely never see anything like it again. That would be a shame, because the NBA is a far richer league when there are a variety of systems and styles in play. In a time when everyone seems to be trying to catch the Warriors by scrambling out to the three-point line and going small, the Pelicans have gone big and free-wheeling. They haven’t taken over the league, but they have created a distinctive, must-watch experience. That experience has produced a record 25-21 this season. In a league where all that seems to matter is championships—Davis wasn’t wrong about that—25-21 may not be enough to justify the continued existence of this version of the Pelicans. There’s nothing wrong with that, of course. AD and Boogie are two great players who deserve to play for whoever they want, and if they want to go elsewhere in pursuit of a title, so be it. But we still stand to lose something special if they break up. Either one could go join the Cavs or the Rockets or the Warriors and play great basketball and win all sorts of glory, but they’d likely do so as lesser versions of themselves. They’d almost have to. I mean, can you imagine anything that would be better than what they’re doing right now?